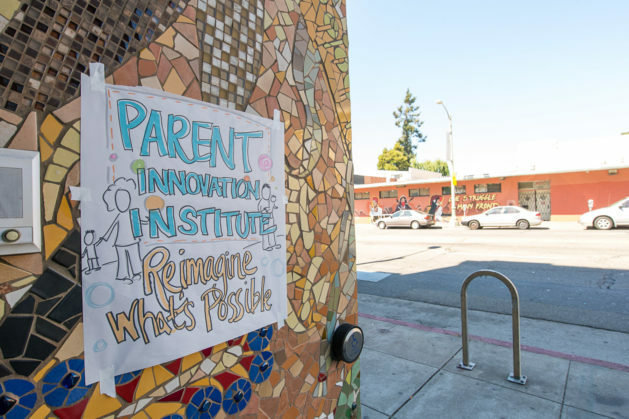 This is the first in a series of articles highlighting the work of the Lab’s Parent Innovation Institute (PII), a yearlong program based in Oakland, California, that brings together community organizations with the dedicated parents and caregivers they serve. Together, they develop strategies that address their unmet needs and ensure their children are kindergarten-ready. 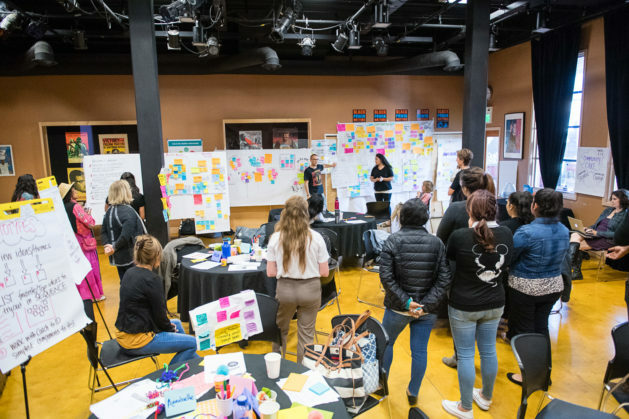 In a spacious room filled with colorful posters of activists and social justice pioneers, a group of people — staff members from nonprofits and the parents they serve — gathered to reimagine how they can better meet the needs of children in their community. 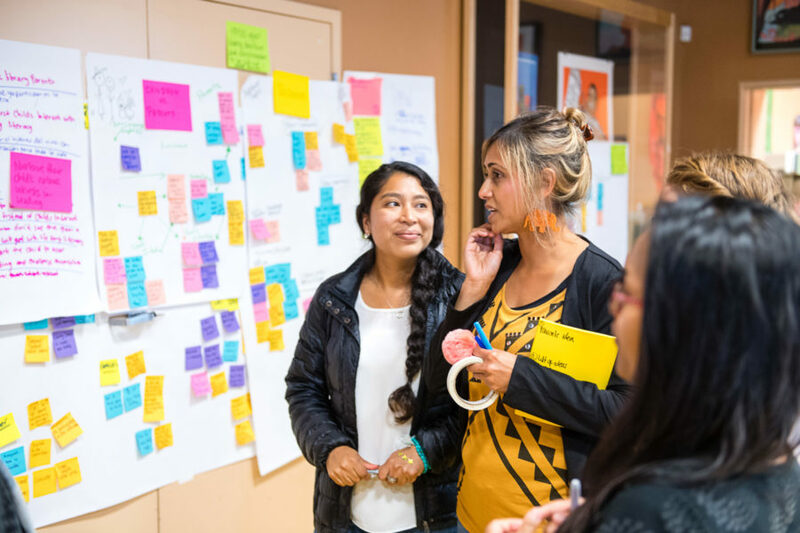 Held at Fruitvale’s Eastside Cultural Center in Oakland, the two-day workshop is a centerpiece of the Parent Innovation Institute (PII). Based on the idea that parents are children’s first and best teachers, the ultimate goal is supporting parents to prepare kids for kindergarten and beyond. 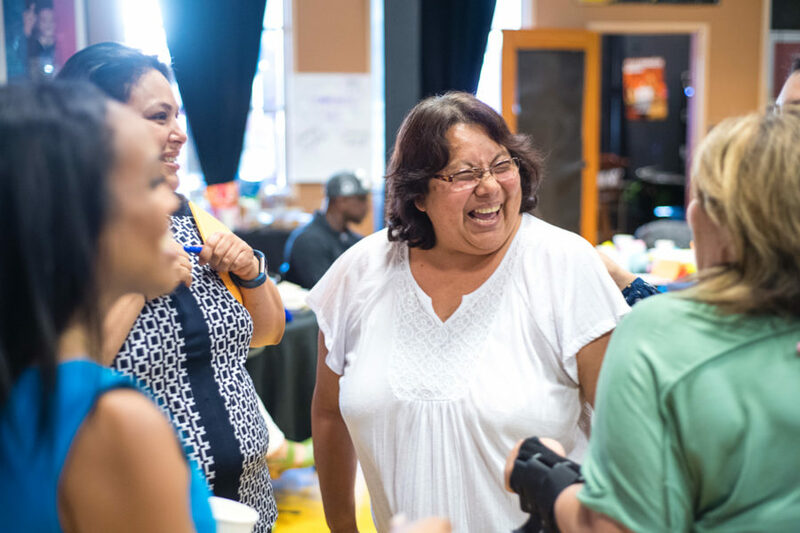 For its inaugural year, PII recruited teams from four parent-facing nonprofits: East Bay Agency for Children, La Clínica de La Raza, Oakland Public Library, and The Unity Council of Alameda County. Each organization included a decision maker, program staff, and at least one parent. This unique partnership is designed for maximum impact: Staff draw on their organizational experience, parents bring a clear vision of what their children need, and PII provides the resources, training, and tools to put solutions into action. Although they have distinct missions, all of these organizations and people share one goal: helping to ensure that children thrive. “I’m proud of taking on a new challenge that will bring more positive outcomes back to the youngest children,” says a program participant. 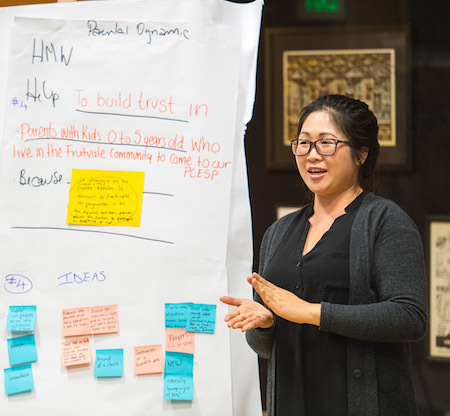 At PII, parents and organizations come together using a process called design thinking, also known as human-centered design (HCD). This highly collaborative and intensive approach encourages asking questions without any preconceived notions or agenda. One framework for these questions is called “how might we.” For example: “How might we increase partnerships between organizations and parents in collaborating in problem solving?” or “How might we strengthen the ecosystem of service providers to collaborate in strategies to better meet the needs of children and families in Fruitvale?” Answering these “how might we” questions is a fundamental step in HCD because it leads more deeply down the path of inquiry. After posing these kinds of questions, the process invites collaborative and creative approaches to answering them. Design thinking is highly collaborative, with groups working together to bounce ideas off one another. It is also generative, building on ideas using a process of questioning and evaluation. Not only does design thinking encourage new ideas, but it empowers people to take risks. “The process builds confidence of individuals to ‘fail forward,’” says Mariam. 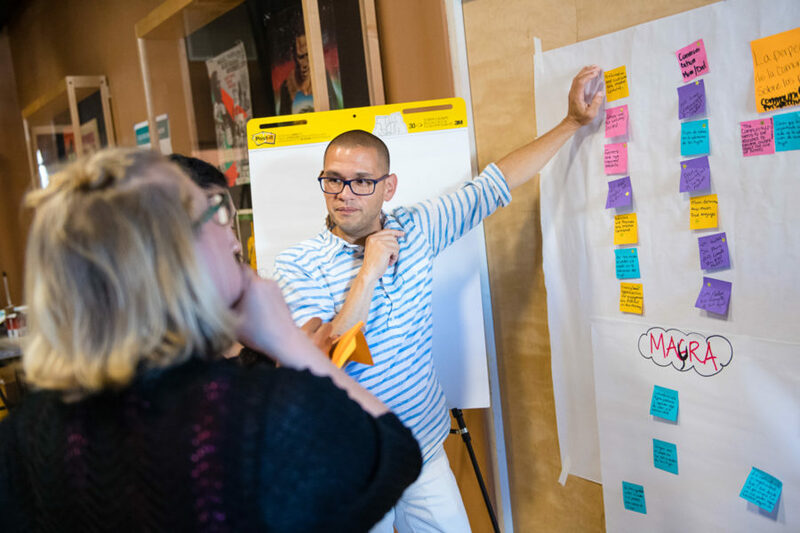 Through experiential learning, training, and coaching, PII is cultivating leaders to build individual capacity to use design thinking to solve problems. With their newfound skills, the hope is that these leaders return to their communities and translate what they’ve learned on an organizational level. Problem solving doesn’t happen in a vacuum, and this is especially true when applied to complex problems. In design thinking, gathering information is a crucial first step. Instead of standard ways of researching like a Google search, human-centered design urges people to think more expansively. After the first workshop, participants were given an assignment to lead interviews, conduct site observations, and evaluate existing research to better understand what the people who use their services want and the barriers they encounter. For Las Promotoras (health educators) at La Clínica, research uncovered how their work fit into the wider context. “We’ve known that obese children develop chronic diseases, but my research helped me look at it from a global point of view,” says Claudia Briones. And interviews revealed deeper layers of truth: For example, The Unity Council knew that dads weren’t participating in their children’s education as frequently as moms. But until they delved deeper, they didn’t realize the extent to which mothers serve as gatekeepers to fathers’ involvement, or that some mothers feel uncomfortable with dads attending events with female staff. Another example is the East Bay Agency for Children (EBAC), which wants to increase participation in pre-K programs. Interviews revealed that parents felt totally overwhelmed by their responsibilities, and that attending events with their kids meant they would have less time for themselves. In the end, the program is about supporting parents. While it’s easy for outside groups to talk about problems in a theoretical way, the presence of parents adds a unique and valuable perspective. That’s why PII requires at least one parent and one staff decision maker on the team, fostering coordination and communication between those who offer services and those who receive them. Such collaboration was on clear view throughout the workshop. On the library team, through design-thinking techniques parents and staff worked hard to understand each other’s perspective and needs. Although there were misconceptions on both sides, they realized they have the same goal: to help more people understand the benefits of the library for families. Together, they ultimately decided to create a small group of staff and parents to spearhead outreach, solicit feedback, and brainstorm ideas. “Our main focus right now is bringing the community that is in the dark about the library inside,” says parent Natalia Hernandez. The structure of design thinking, including open-ended questions and an individualized approach, creates space for creativity and innovation. Participants were able to free their minds and encouraged to create “wild ideas” within the working sessions. “We are being pushed to think beyond and look for more innovative ideas,” writes a program participant in an anonymous post-workshop survey. 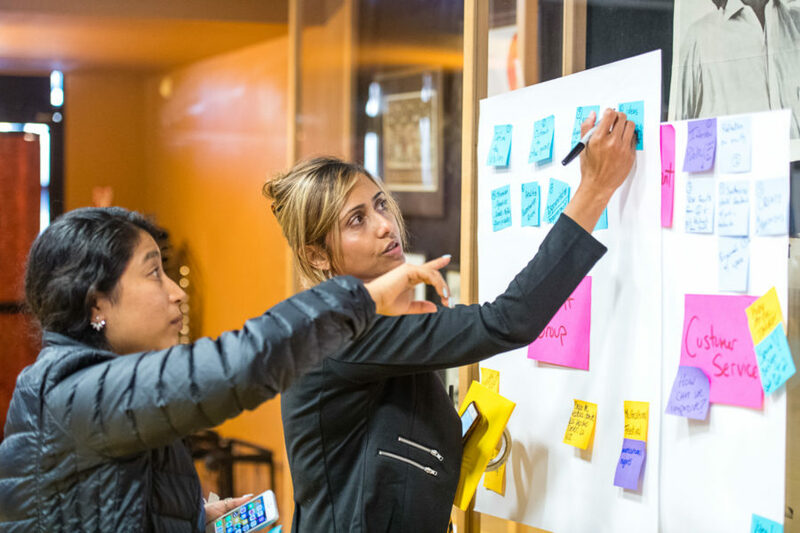 Through group and individual exercises — and the liberal use of sticky notes and whiteboards — each team used design-thinking techniques to find themes, hone in on specific organizational roadblocks, and identify the areas they want to improve. The workshop gave people who work at the same organization the chance to know each other better and to more fully appreciate their contributions. 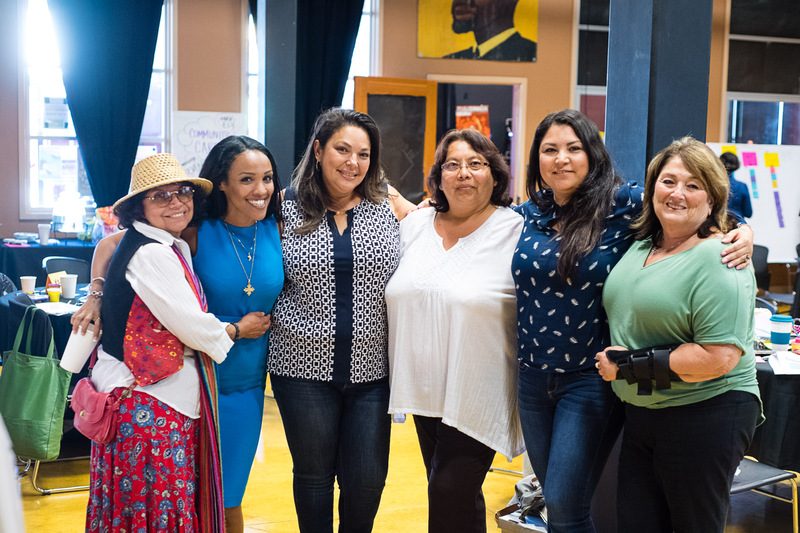 Since many of these organizations serve the same families in Fruitvale, the workshop structure not only encourages people within an organization to collaborate, it also helps break down silos and promotes networking. In fact, a workshop follow-up survey showed that 100 percent of participants either agree or strongly agree that they feel part of a practice community with shared purposes and values. “I’m proud of the additional rapport we’ve built within our teams as well as the other PII members of the community,” writes a program participant. While brainstorming is a necessary step, PII’s ultimate goal is finding solutions that can be implemented at each organization. Moving from ideas to concrete solutions, the teams pitched a prototype to the larger group and gathered feedback to prepare for bringing it to the community. Some of the groups had epiphanies that changed their whole perspective. For Las Promotoras from La Clínica, human-centered design uncovered a new way of thinking about obesity. Until now, they had addressed obesity through nutrition education. However, throughout the process the team discovered that emotions play a larger role in the epidemic than they suspected. 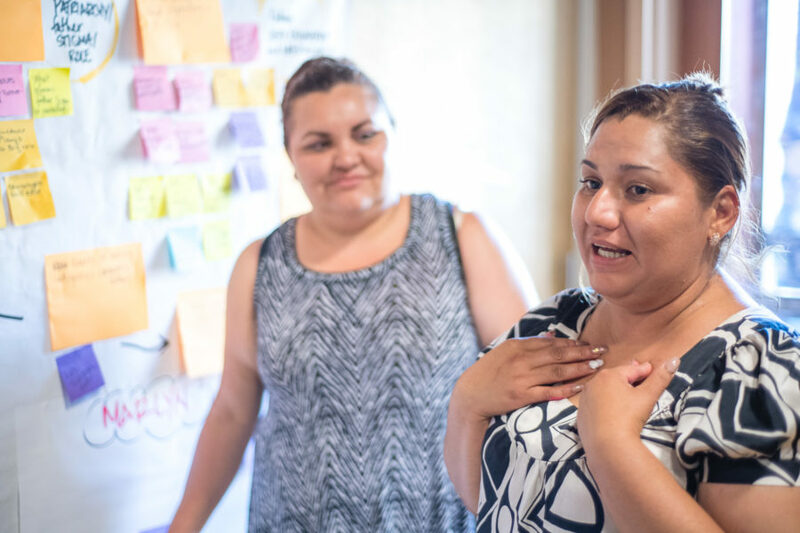 “We were asking ourselves, ‘What is the main reason people in our community aren’t eating healthy foods and providing healthy snacks and food to their family?’” says Marina Bautista. “We realized that a lot of it had to do with mental health. There is a lot of stress, isolation, and loneliness in our community. Many people think of food as self-medication and it becomes an addiction.” To this end, rather than talking about specific foods to buy and eat, their prototype focused on ways to help people, particularly mothers, deal with their stress in new ways instead of overeating, like exercise, yoga, and meditation. Others realized that they needed to create a stronger foundation for their existing work. The EBAC team focused on ways to improve parent engagement, starting with the basics like revamping their written materials and creating an easy-to-read map to make it easier to find the organization, which is inside a school and behind several doors. They also plan to create a video that encourages people to use the program and that will lead parents to connect with each other. “The main focus is to explain that going to a group will have a positive impact on their child, and to stress to the parent that learning early education is fun,” says Paul Byrd. While much work had been accomplished, the experience wasn’t perfect. By the second afternoon, some participants were physically or mentally tired, or confused about how everything they had learned would fit together. Some felt skeptical about the chances of implementing their ideas when faced with roadblocks from organizational leaders. Others felt wary of taking their ideas back to their communities with the knowledge that they would inevitably be altered and maybe even scrapped altogether. These very real difficulties are normal, explained Mariam, who says that design thinking is meant to be confusing when many ideas are in process. Meanwhile, Institute staff spent the time between workshops gathering feedback from participants, evaluating overall program designs, and using qualitative and quantitative methods for tracking the program. “We are designing the program in real time, which is exciting and challenging,” says Mariam. The Institute aims high. Over the span of four workshops, PII wants to do more than improve services. 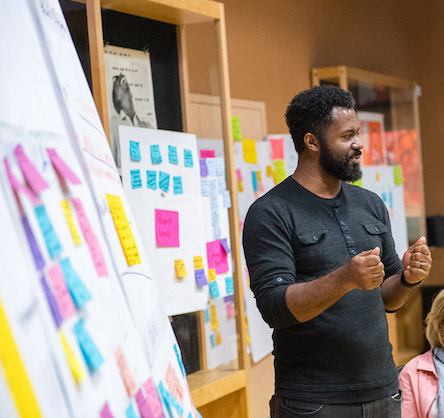 It wants to create leaders of the future who feel empowered and confident to use design-thinking tools to solve complex problems in a way they never might have imagined. For The Unity Council’s Steven Salinas, this confidence has created a sense of excitement about what the future might hold. “Even the wildest ideas have possibilities,” he says. Learn more about our The Parent Innovation Institute.